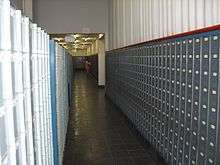 NamPost is the company responsible for postal service in Namibia. It currently has 743 employees and reserves of 2.51 million N$. The CEO of NamPost is Festus Hangula. The first postal services in South-West Africa started in 1814 with the deployment of messengers facilitating communication between the early mission stations at Warmbad and Bethanie and later to Keetmanshoop and Gross Barmen. This service was expanded in 1846, connecting the South-West African mission stations to those in South Africa. The first post office of South-West Africa was founded in Otjimbingwe in 1888, further offices were established in Windhoek (1891) and Swakopmund (1895). In 1992 NamPost was founded, managing 92 post offices in Namibia. In 2012 this number has risen to 135. 1 2 3 Heinrich, Dirk (1 August 2012). "Vom einfachen Postläufer zu NamPost" [From simple postal messenger to NamPost]. Allgemeine Zeitung (in German).